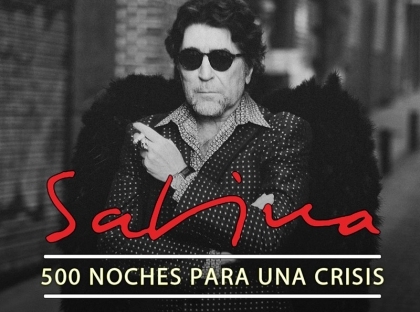 Spanish mythic singer Joaquín Sabina is playing next wednesday, April 22 at the famous Palau Sant Jordi, Barcelona. The show will start at 9:30 p.m. This concert is within the tour '500 noches para una crisis', and the singer from Ubeda is playing songs from his favourite and most famous album, '19 dias y 500 noches' which is on its 15th anniversary. He will also offer some sparks of his new coming work. So are you going to lose this chance to see one of the best composers in the history of Spain? Tickets are on sale on ticketmaster and also in selling points such as Carrefour, Halcon Viajes or FNAC. Prices are from 30€ (general) up to 185 (premium golden ticket), depending on how far the stage is. For more info call: 902 15 00 25. Joaquín Ramón Martínez Sabina (Úbeda, Jaén, Spain, 12 February 1949), known artistically simply as Joaquín Sabina, is a singer, songwriter, and poet. He has released fourteen studio albums, two live albums, and three compilation albums. He performed both solo and with a group for his live albums, performing with Javier Krahe and Alberto Pérez in La mandrágora, the group Viceversa in a 1986 concert, and with Joan Manuel Serrat in Dos pájaros de un tiro (Two birds with one stone). Sabina suffered a stroke in 2001 and although he physically recovered, he entered a deep depression which resulted in a four-year-long concert hiatus. He recovered and released his eighteenth album, Alivio de Luto, in November 2005 and in 2009 he released his album, Vinagre y rosas. In 2012 he released his latest album in collaboration with Joan Manuel Serrat: La Orquesta Del Titanic.